With the Winter Olympics set to open in Sochi, Russia, in February, Moment’s Josh Tapper talks to David Wallechinsky, author of The Complete Book of the Olympics and president of the International Society of Olympic Historians. • Why aren’t American Jewish Olympians, such as swimmer Mark Spitz, as revered as other American Jewish athletes, like Sandy Koufax or Hank Greenberg? Forgetting about Jews, one of the problems with Olympic sports is that they happen once every four years, and people don’t notice the athletes. An athlete can ride a wave for a few weeks, and one or two will become famous, but it’s very difficult. It has more to do with the short attention span of the American sports fan. • From the 1948 Games through the 1950s, most of the Jews winning medals came from European countries. What accounts for this, as well as for the dearth of successful American Jewish Olympians at that time? In America, I think it’s about Jews finding their way in other fields. They didn’t move into sport as much after World War II. But in communist countries, like Hungary and Poland, those governments were seeking out athletes. Whatever discrimination happened in other fields was overlooked in sport at the end of the war. Those countries saw success in the Olympics as a matter of national pride; the person’s ethnic background was not important. So we get sprinter Irena Kirszenstein-Szewinska of Poland—she won seven medals in five different events between 1964 and 1976. Then there’s Ágnes Keleti, a Hungarian gymnast. During the Holocaust, she bought the papers of a Christian girl and used them to survive. 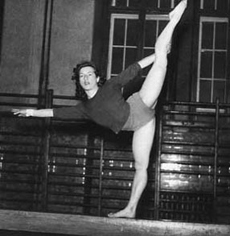 When the war was over, she was discovered and later became one of the great women gymnasts of the early 1950s. • The terrorist attack at the 1972 Games in Munich casts a long shadow over the Jewish Olympic experience. How significant are those games for Jews? It’s very big, not just for Israelis but for all Jews. There are a couple ways of looking at it. There was a struggle over trying to get the International Olympic Committee (IOC) to hold a moment of silence on the 40th anniversary in London, at the 2012 Summer Olympics, which they didn’t want to do. But what concerns me is that there are elements within the IOC that simply don’t want anything negative out there. At the Olympic Museum in Lausanne [which opened in late December after a 23-month renovation] there will be no mention of Munich. Why? It’s something that happened at the Olympics, but it’s not part of the Olympics. • Decisions like those seem to inflame longstanding accusations that the IOC as an institution is anti-Semitic, dating back to Henri de Baillet-Latour, who was president from 1925 to 1942 and was friendly with the Nazis, and Avery Brundage, who opposed a boycott as head of the U.S. Olympic Committee in 1936 and, as IOC president, refused to cancel the Munich Games after the attacks. I don’t think it’s institutional, but there have been very powerful individuals, like Brundage, who certainly acted in an anti-Semitic manner. The current head of the IOC, Thomas Bach, was part of a German-Arab business group that supported the boycott of Israeli products. There was a request when he became president of the IOC in September to resign from that organization. And shortly after he was elected, he resigned. • There’s been a lot of clamor for the IOC to take a hard stance against Russia’s anti-gay laws. Why hasn’t it done so? If the IOC didn’t do anything in China, why would you think they’d do anything with Sochi? It’s a leadership failure. There is nothing in the IOC charter that prevents its president from speaking out against human rights abuses. In fact, it’s an opportunity to use the bully pulpit. The thing is, once the Olympics are assigned, the IOC is not going to take them away. There’s so much money invested in getting them going. So the organizing committee will do whatever it wants. It doesn’t have to pay attention to what the IOC says. • What do you think of the comparison some people, including Jewish leaders, are making between Hitler and the 1936 Games and Putin and Sochi 2014? I think that’s a bit extreme. What the Nazis were doing was way worse. And in fact, what the Chinese communist government does is way worse than what Putin’s government does overall. Also, I don’t see the Russians stopping gay athletes from competing. It’ll be interesting to see if there are protests. There are rules in the Olympic charter that say that athletes cannot make a political stand, but the question is: Is wearing a rainbow-colored T-shirt a political statement? • Who is the greatest Jewish Olympian? Mark Spitz. His performance in 1972 in Munich [when he won seven gold medals in swimming] was amazing. In the category of further information: two Jewish runners, Marty Glickman and Sam Stoller, were forbidden from competing at the 1936 Olympics by the American Olympic committee, which was headed by Avery Brundage at the time. See http://www.ajhs.org/ajhs-new/scholarship/chapters/chapter.cfm?documentID=271. Brundage also certified that the Nazi government was supporting full participation of German Jewish athletes in the Munich games, despite fulsome evidence to the contrary (see http://repository.upenn.edu/cgi/viewcontent.cgi?article=1073&context=asc_papers). Later the German government hired Brundage’s construction company to build the German Embassy in Washington D.C. (http://onlyagame.wbur.org/2013/08/31/glickman-documentary). While Anti-Semitism has been attributed to Brundage, I have to protest as a Zionist that Brundage’s actions were completely consistent with the power dynamics of the pre-Israel political landscape. Brundage wanted an ally against communism (ibid. ), wanted an Olympics of maximum pomp and circumstance (ibid. ), and needed contracts to sustain his construction company (http://www.econlib.org/library/Smith/smWN.html 🙂 ). Prior to the existence of Israel, there was no cost for sacrificing Jewish participation to further these goals. After a majority-Jewish sovereign country came into existence, the costs increased exponentially. Subsequently Jews – at least those in the half of the global Jewish populace the lives outside Israel – have been allowed to participate in athletic contests around the world, despite the negative impact on long-standing anti-Semitic stereotypes. Brundage himself did not intervene to prevent Jewish athletes from participating in Olympic events on any occasion after 1948. This can only be regarded as coincidental if one ignores self-interest as a component of organizational behavior. Thank you for the interesting and informative article, opinions and the reply above. While the comparison of Russian’s current treatment of LGBT people with the Nazi’s and the 1936 Games treatment of Jews may be extreme, there are ominous similarities. The government legalization of shame and blame with the intention to banish and humiliate a minority of people in its society to invisibility with penalty of fines and imprisonment seems disturbingly similar to what started to happen to Jews after the Nazi’s came to power in the early 1930s. The antiquated, vehement and often violent response of the general populace in Russia towards LGBT people, fueled by the government’s decision and support, would make it extremely difficult and frightening for a gay Russian athlete to even think about coming out. I have not heard of any gay Russian athletes(one barely hears about American gay Olympic athletes who are out at the time of competition) to make a determination that Russia is not stopping gay athletes. Based upon the way the government and the populace are treating non-Olympic LGBT people who are visible and out, I have a gut feeling that a Russian Olympic athlete who actually had the courage to come out would suddenly disappear from public view and not be allowed to continue training on the Russian team.